When you’re looking for exact replacement belts for your Partner saws you can find them at Jack’s. 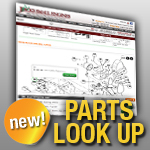 At Jack’s we want you to be able to get your parts quickly and easily. Use our My Garage feature to store your engine and equipment information for quick reference for future projects.